This 2005 34' Mainship Rum Runner II hardtop pilothouse is equipped with a single 370hp Yanmar diesel. It has a rebuilt (2018) 3.5kw NextGen generator, new Freedom HF invertor, A/C has been serviced, New Sea Fire fire suppression bottle installed (old one was outdated and could not be inspected), bow and stern thruster, oil X-changer system, Raymarine Hybrid Touch unit with Raymarine HD radar, compound and waxed December 2018.Seller is looking for an offer. United Yacht Sales New Jersey would love to guide you through a personal showing of this 34' Mainship 34 Rum Runner Ii 2005. 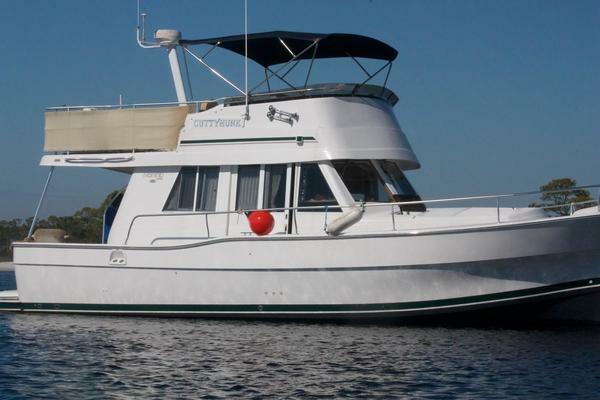 This yacht for sale is located in Jacksonville, Florida and priced at $104,900. For a showing please contact us by filling out the form on this page and we will get back to you shortly!